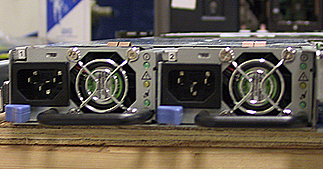 The Dell PowerEdge 1850 rackmount server holds up to two (2) 550-watt power supplies. One is required to power the system with a second power supply for redundancy. All part numbers are interchangeable and user-replaceable. Unless otherwise noted, our power supplies have been tested, pulled from working machines and are covered by our 90-day parts replacement warranty.